How do I create a Patient List? Reach allows you to automatically send the right message to the right patient at the right time. Lists are how we target the right patients. Use the data you’re already collecting in your EMR to segment patient populations into focused groups based on specific patient characteristics such as age, diagnosis, body part, and many others. Segmenting patients into smaller attribute-based lists allows you to send more relevant messages to your patients before, during, and after care. Upon setup, the Lists tab will contain a handful of pre-populated options, ensuring that you have the right building blocks to get you started. In this example, we are going to create a list of all patients under 40 who are being treated for a knee-related diagnosis at the Boston facility. Let’s get started. To create a list, open the Campaigns drop-down and click Lists. 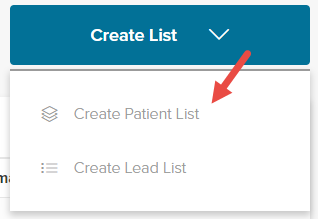 In the Lists page, select Create List then Create Patient List from the top right corner of the page. In the Tell Us About Your List section, enter a name and description for the list. Be as clear as possible with your list name and descriptions, as these will help you differentiate lists going forward. List names and descriptions will only be visible to other users within your organization with access to Reach, patients will never see this information. Next, add in the first property to begin segmenting your patient population. See List Properties for more information on properties. Let’s continue building our list by clicking Add a Filter. When using a filter, you are adding AND logic, which will reduce the number of patients that match the criteria. This is because the patient will have to meet all of the criteria listed. Now, let’s say you want to build a list composed of patients being treated for knee or foot related diagnoses. We would accomplish this by using the Add Parameter button. This incorporates OR logic which is more inclusive and will increase the number of patients that match the criteria. This is because they only need to match one of the criteria listed. For example, the filters used below will generate a list of all patients who are being treated for knee OR foot-related diagnoses. For a patient to be included in this list only one of the parameters must be true. Remember: Add Filter = Exclusive, Add Parameter = Inclusive. Once you have selected all the necessary filters and parameters for your list, click the Save List button to save. You now have a list of patients that can be specifically targeted based upon their unique attributes that have been collected in your EMR. Check the Details section and ensure that is populating with patients. If your list returns no patients, you may want to check your filters and parameters. You can download this information as a CSV file using the Cloud Download icon.